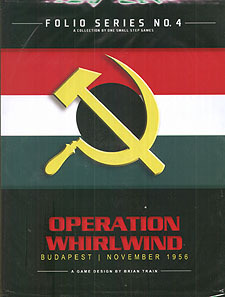 OPERATION WHIRLWIND is a simulation of the situation in Budapest in November 1956. The Soviet-imposed Communist government of Hungary has fallen. Newly inaugurated President Imre Nagy, swept along by the momentum of the popular revolution, has declared an end to the one-party system and threatened to pull out of the Warsaw Pact and to declare neutrality. The Soviet government cannot allow this defection and launches "Operation Whirlwind," a military intervention in Hungary to restore order culminating in a desperate battle in the streets of Budapest.